Drum Expo 2013: Canadian cymbal giant Sabian is globally renowned as the world's leading designer and maker of cymbals, offering instruments and sounds for every musical application, playing level and price point. Sabian endorsers include Neil Peart (Rush), Jojo Mayer (Nerve), Mike Portnoy (Dream Theater, Flying Colors, Winery Dogs), Dave Weckl (fusion legend), and Jack DeJohnette (jazz great), as well as renowned percussionists from the Los Angeles Symphony, Royal Opera House (Covent Garden) and Vienna Philharmonic Orchestra. Check out the full range of Sabian products here. Situated in New Brunswick, Canada, with offices in the US, UK and Europe, Sabian is the world's most innovative cymbal maker. Click here to read more about the Sabian 16" and 18" Xs20 dB Control Crash. Click here to read more about the Sabian 14" Xs20 X-Celerator Hats. Click here to read more about the Sabian 21" Xs20 Medium Ride. 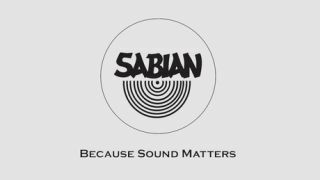 For more information, visit the official Sabian website, or connect with them on Twitter, Facebook and the Sabian Vault onYouTube, or Sabian Experience on YouTube.You can also check out the latest on Sabian's Cymbal Vote and learn more about their XS20 cymbals.